We exist to exalt the triune God by embracing his Gospel and engaging those around us. What is most important to us is not ourselves, but God and His glory. We want to spend our lives exalting Him; that is why we have been created. We are convinced that the most important message ever uttered is the good news of God's gospel, and that we find real life and real identity and real hope by embracing Jesus Christ and His gospel. As those gripped and transformed by His gospel, we want to engage others with it, that they too might come to embrace God's gospel and exalt Him. As a church our desire is to focus most clearly on who God has called us to be and what He has called us to do. While there are many areas in which we could invest, we want to keep what is central to God central to our own hearts as individuals and as a church. Therefore, in light of God's Word, we desire the following values to shape all of our ministries as a church. Supremacy of God: We believe that we exalt the Triune God by recognizing that He is supreme over all things, and we were created by Him for His glory. This means our aim is to exalt God in all that we do. As we live our lives exalting God, we will find our greatest joy (Isaiah 43:7; Romans 11:36; 1 Corinthians 10:31; Colossians 1:16; Revelation 4:11). Centrality of the Gospel: We believe that we exalt the Triune God by keeping His Gospel central in all we do. This means that how we think, what we say, how we respond, why we do what we do – everything should be informed by and seek to make much of the Gospel (Romans 1:16; 3:21-26; 1 Corinthians 15:3-4). Robust Theology: We believe that we exalt the Triune God by knowing who He is and how we are to live before Him. This means we take God and His Word seriously, and that we strive to know Him and His Word better (Deuteronomy 6:4-6; Isaiah 66:1-2; John 17:3; 1 Timothy 6:15-16). Fervent Prayer: We believe that we exalt the Triune God by acknowledging that He is sovereign over all things, and in and of ourselves, we are completely unable to be what He has called us to be or do what He has called us to do. This means we are humbly driven toward Him in fervent prayer (Luke 11:1-13; 18:1-8; Philippians 4:6; Colossians 4:2; 1 Thessalonians 5:17). Sufficiency of Scripture: We believe that we embrace His Gospel by looking to the Scriptures alone, not by looking to the wisdom of this world, nor by looking inward to ourselves. This means all we need to know about who God is and how we can be right before Him is contained in His Scriptures (1 Timothy 4:13; 2 Timothy 3:16-17; 2 Peter 1:20-21). 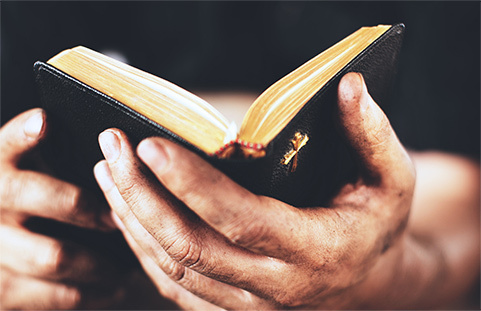 Christ-Centered Preaching: We believe that we embrace His Gospel by reading the Scriptures as one large, magnificent story, where the Triune God reveals to us how He saves sinners for their good and His glory. This means we strive to preach not bare morals, isolated Bible stories, or merely historical information, but instead, Christ as Savior and Lord (Luke 24: 44-49; John 5:39; Acts 20:18-21; Romans 1:1-2; 1 Corinthians 2:2). Radical Discipleship: We believe that we embrace His Gospel by laying down our lives and following Him. This means our desire is to see our lives and those around us radically transformed by God, so that no part of who we are is left untouched by His Gospel (Matthew 28:18-20; Luke 9:23-26; Ephesians 4:1; Titus 2:11-14). Biblical Church Membership: We believe that we embrace His Gospel individually, but we, as individuals, are called to join ourselves to a local church. This means we take local church membership seriously, for it is in and through such loving relationships that we encourage, correct, help, teach, and protect one another (Matthew 18:15-20; Acts 2:44-47; 20:28; Hebrews 10:24-25; 13:7, 17; 1 Peter 2:9-10). Faithful Leadership: We believe that we embrace His Gospel as we joyfully and willingly submit to the faithful leadership that God has placed in our lives. These leaders are called elders/pastors, and they are to be biblically qualified men who love, teach, and equip the church. This means our leaders are servant leaders, worthy of imitation (Acts 14:23; 20:28; Ephesians 4:11-16; Hebrews 13:17; 1 Peter 5:1-3). Intentional Evangelism: We believe that we engage those around us by being intentional in our evangelism. This means we pray fervently for and strive to build relationships with those around us in all that we do so that we might share the good news of Jesus and see others comes to embrace the Gospel (Matthew 28:18-20; Acts 1:8; Colossians 4:3-6). Community Oriented: We believe that we engage those around us by reaching out and serving those in our community. This means we will not withdraw from our neighbors, but we will reach out to them as a means of engaging them with the Gospel (Matthew 5:14-16; 28:18-20; Galatians 6:10; 1 Peter 2:9-10). Global Missions: We believe that we engage those around us by being senders and goers around the globe. Senders send missionaries out by sacrificial giving. Goers go as missionaries by sacrificial living. This means we believe the only hope for all the world is that people come to embrace the Gospel (Matthew 28:18-20; Romans 15:22-24; Philippians 4:14-18; 3 John 5-8; Revelation 5:9-10).